Why Must I Kill Women And Kids? I swear to God this place is worse than Hell. Who knows who's right? They think they are and we think we are. Both sides are losing men. I wish to God this War was over. From a U.S. 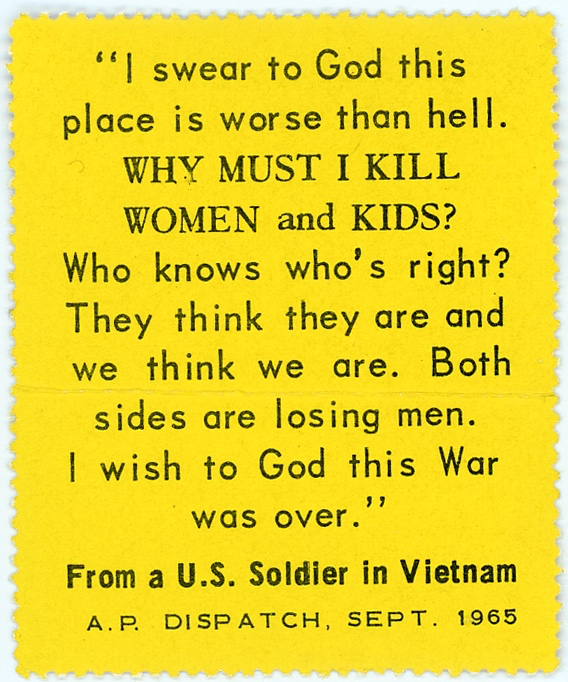 Soldier in Vietnam -- A.P. Dispatch, Sept. 1965. The gummed label is one in a series of FAN-SHAN stickers or "night raiders" from Peace Products, Dr. J.S. Kennard, Jr., Manager, 26 Winant Road, Kendall Park, N.J. 08824.